All Wood Decay is caused by bacteria and fungi. They eat into the cells and leave rotting wood behind. If they were deprived of oxygen, heat and moisture, they could not exist. Before wood decay sets in though we first have a beautiful tree which may be cut down for timber and used as furniture or buildings. 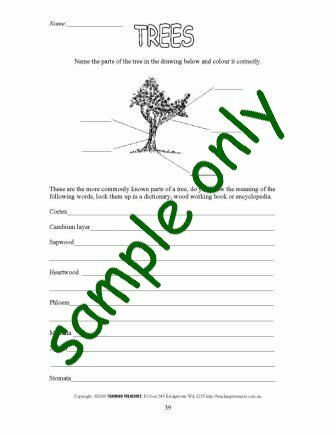 If you would like to learn more about trees check out the 'Tree Worksheet'. An answer key is provided with the purchase of the book because the worksheet is not an easy one! Have you ever gone on a fungi hunt? Fungi is fantastic to see because of the different colours, shapes and sizes. Check out the fungi area! There are projects, art and craft, an interactive activity, a fungi photo gallery and more.